The interior of the basket illustrated in fig. 1. Detail of the interior of the basket illustrated in fig. 1, showing the areas of yellowed restoration. See Plate 12 on p. 266 for the basket after conservation. 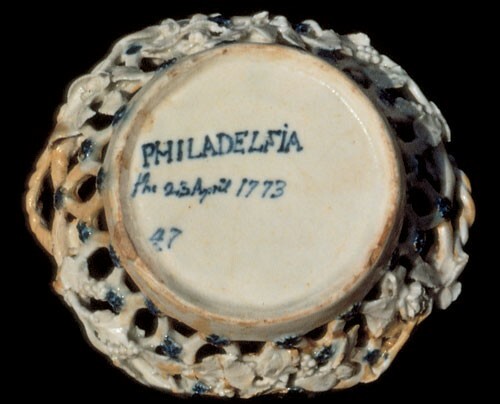 We can hardly believe eighteen years have passed since first we heard that a porcelain basket, boldly inscribed “PHILADELFIA / the 23 April 1773 / 4.7” in underglaze blue, was about to be sold at auction in New England. The basket had been consigned by a man who believed it once belonged to a vice president of the United States but had been in his family for generations. He claimed it had been made by the pre-Revolutionary porcelain manufactory of Gousse Bonnin and George Anthony Morris. The round reticulated basket had twisted-rope handles, and twining in and out of openwork circles on the sides were vines bearing bunches of grapes, grape leaves, roses, and rose leaves. We noticed there was no decoration at its center, but the exterior was surrounded by three bands of floral bosses touched with Prussian blue (figs. 1-3). Much of it was so encrusted with yellowed and peeling painted repairs that it was anyone’s guess as to how much of the original lay underneath; we knew at a glance the basket had seen the interior of a shop belonging to Philadelphia’s oldest and most famous restorer. There were other problems. Having owned and studied two other pieces of Bonnin and Morris porcelain, we were aware that Graham Hood believed their factory had shut down for good in 1772. No other surviving baskets had twisted-rope handles, nor were there any other forms with applied roses, rose leaves, or fruiting grapevines. 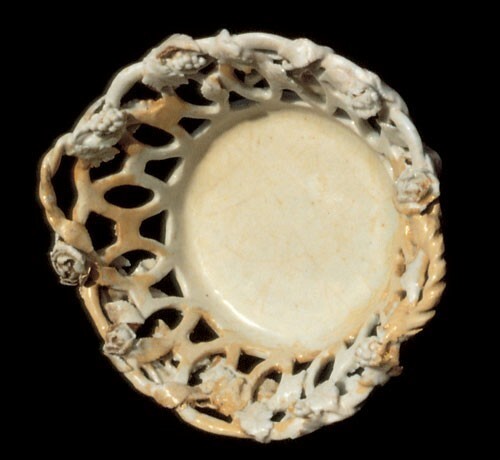 The auction gallery had received information that no sherds with this type of ornament were among the wasters curated by the Philadelphia Museum of Art after excavations at the factory site during 1967 and 1968. Worse, the Bonnin and Morris attribution had been denounced by a prominent decorative arts curator from a nearby museum. We purchased the controversial basket on October 28, 1989, because we believed it spoke for itself with its blue inscription “PHILADELFIA” on the bottom. After all the yellowed material covering it was removed, the example was found to be much less damaged than feared: there was merely a small portion of one handle missing and the top of one circle. If not Bonnin and Morris, who else could have made the basket? Might there have been another phantom porcelain manufactory in Philadelphia? Doubts sent us back to reexamine every scrap of primary source material and contemporary accounts of the factory we could find, as well as conclusions of later writers. Added to newspaper notices discovered and published by Alfred Coxe Prime were statements issued before the establishment of the American China Manufactory by the American Philosophical Society and by Dr. Benjamin Rush rediscovered by Michael K. Brown and an impressive body of work produced over the years by Graham Hood, who first established that the factory made porcelain and most recently fleshed out the elusive Mr. Bonnin for the Minneapolis Institute of Art. But how to explain the date, April 23, 1773? By November 1772 the proprietors of the Philadelphia porcelain manufactory had admitted defeat. They had been publicly humiliated by their workers walking off the job and soliciting charity, an event exacerbated by a newspaper article written by Thomas Byerley that resembled Mark Antony’s oration at Caesar’s funeral. It should never be said that Byerley and his uncle Josiah Wedgwood were friends of American industry. Any Gentleman inclining to engage in the China Business, may now enter on very advantageous terms, as these works are completely fitted, and a young man of sobriety and integrity in town, from Germany, who is completely skilled in the whole process of compounding the materials, upon a plan fully equal to the best in England, and who would readily undertake the management, upon reasonable terms, either in partnership or otherwise....The public may be positively assured this is a real sale. The porcelain basket inscribed “PHILADELFIA / the 23 April 1773 / 4.7” challenges assumptions that the manufactory lay idle while it was being offered for sale. After all, does a family leave its home when the “For Sale” sign goes up on the lawn? Does a business owner ever give up hope of finding an investor? The inscribed date—ten days before the May 3 announcement that a young man was in town who could make porcelain and manage the works—is provocative. It would seem safe to presume that Bonnin, in a last-ditch attempt to attract a backer, partner, or buyer, would have made the young German prove his claim and show what he could do. It takes about one week to fire up and cool down a kiln of china. Ten days would be just time enough to inspect the ware, declare it a success, and announce the accomplishment of the young German in the May 3 issue of the Pennsylvania Chronicle. This basket is by far the most ambitious form known, and its markings imply a maker’s pride but also assure that it could be identified as his work. The “4.7” cannot indicate a price, as baskets were sold for 10 shillings each, but it might, for example, indicate that the basket was the fourth of seven trial pieces. There are several details—especially the twining vine that trails through the openwork rim bearing grapes and grape leaves, roses, and rose leaves between the twisted-rope handles—all of which can be found on some German porcelain. Other Bonnin and Morris baskets are circled by three bands of applied four-petal flower heads. Here, they have been replaced by small, blue-daubed bosses resembling those on Westerwald stoneware. This suggests that the molds for the flower heads had become worn or lost. The lack of any painted decoration at the center would simply indicate that there was no professional painter available to decorate it. 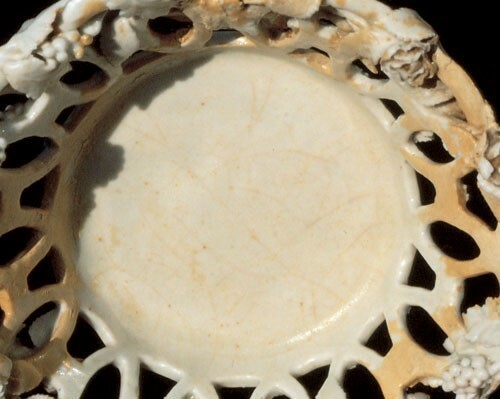 A logical reason why no applied bosses, roses, or fruiting grapes were found among the sherds discovered by archaeologists is that the “PHILADELFIA” basket was the only attempt at this kind of embellishment. Despite evidence of this successful 1773 emission, still no buyers came forward. On August 3, machinery, vats and tubs, and “a rolling press, for copper-plate printing” were among the articles the factory offered for sale. Gousse Bonnin wanted to go home to England and finally did so in September. George Anthony Morris died in North Carolina in October 1773. The fate of the factory was put in the hands of the sheriff. Finally, in July 1774 Joseph Morris, father of George Anthony Morris, bought the works and most of the lots. There can be only one explanation for this rash action—that Morris was protecting his investment, revealing that he might have been one of the factory’s chief financial backers all along while trying to provide a livelihood for his son. Within a month he had divided and conveyed some of the factory and property to Matthew Clarkson and Edward Bonsall, who also offered “money to be lent on interest” as well as real estate. They subsequently dismantled the factory and sold the equipment bit by bit. We would like to thank the following individuals for sharing ideas and information during the prepartion of this article: Joanna Pessa, our decorative arts researcher; Jack Gumbrecht; George R. Hamell; Ian Simmonds; and Alexandra Kirtley. Alfred Coxe Prime, comp., The Arts and Crafts in Philadelphia, Maryland and South Carolina, 1721–1785: Gleanings from Newspapers ([Topsfield, Mass. ]: Walpole Society, 1929); Graham Hood, Bonnin and Morris of Philadelphia: The First American Porclain Factory, 1770–1772 (Chapel Hill: University of North Carolina Press, 1972); Graham Hood, “The American China,” The American Craftsman and the European Tradition, 1620–1820, edited by Francis J. Puig and Michael Conforti (Minneapolis: Minneapolis Institute of Arts, 1989); Michael K. Brown, “Piecing Together the Past: Recent Research on the American China Manufactory 1769–1772,” Proceedings of the American Philosophical Society 133, no. 4 (1989): 555–79. Hood, Bonnin and Morris, pp. 60–62, Appendix 9. Pennsylvania Chronicle, December 11, 1772; Pennsylvania Gazette, December 16, 1772. Pennsylvania Chronicle, May 3, 1773. Pennsylvania Journal, August 3, 1774. Brown, “Piecing Together the Past,” pp. 577, 578 (p. 89 in this volume). Pennsylvania Gazette, October 19, 1774; Dunlap’s Pennsylvania Packet, or, The General Advertiser, December 5, 1774.